A PAINTING DONE A HUNDRED YEARS AGO still has the power, even today, to move us by its beauty, be it a landscape, a portrait or a still life. Owners who treasure their old oil paintings recognize how fragile they can be and how easily susceptible to damage. Accidents, humidity, sunlight and smoke are the most common causes. A painting can deteriorate slowly and steadily or degrade rapidly in a short time.Old oil paintings are fragile and easily harmed. Household accidents are the primary cause of such mishaps. Harsh sunlight will fade the painting’s original colours. The degrading effects of coastal climate turns the original varnish brown and opaque so the painting gradually disappears from view. People who own paintings find it difficult to know what to do in these circumstances. The temptation to see a gloomy old painting in a chipped gold frame that has been hanging and gathering dust for generations, maybe ripped, torn or with the paint flaking off as destined for disposal should be resisted. The idea that it might, in addition, be an Old Master is not impossible. In fact, any half -decent oil painting, done before 1850 is, by definition, an Old Master. Contrary to what urban legend may suggest, it does not have to be a work by a word famous master or sell in a big media-rich auction in London or New York for tens of millions. Neither does it have to be signed or dated (both of which were often added by others long after the painting was completed) to acquire the cachet of an Old Master. Generally artists like Gustave Courbet, Jean-Baptiste-Camille Corot and Eugène Delacroix who were active at the beginning of the nineteenth century are considered the last artists working in the period of the Old Masters that begins with the early Renaissance. From then forward, with the stylistic innovations of Edouard Manet the birth of the Impressionist school and modern painting is accept to have begun. An oil paintings safety can be affected by your local climatic conditions. For example, here in Monte-Carlo, on the Cote d’Azur and in Provence we have additional problems in protecting our oil paintings. If you do not shade the painting from direct sunlight and the harsh summer sun, its colours will bleach and fade. How or where you hang your can affect its safety. Sharp changes in temperature and humidity frequently damage paintings on wood. The timber support will split or warp or become attacked by wood-boring termites. The paint layer itself can blister and eventually flake away from the canvas. Unfortunately domestic disasters are more common, but are more easily avoided by taking preliminary precautions when hanging or moving your oil painting. Never, ever, lean a canvas painting against the wall at floor level when, for example, redecorating a room. (Insurance assessors estimate fifty percent of paintings’ damage is caused by people inadvertently putting the toe of their boot through a canvas that they had propped up against the wall). Other dangers are vacuum cleaners and distractedly leaning a piece of heavy furniture against the painting. Transporting paintings from overseas is another hazard familiar to owners. Paintings can arrive in containers that have become water-logged during the journey or the painting’s surface scratched and dented. This occurs to paintings transported by even the most scrupulous of shippers. You should be standing by when this operation is being carried out. It will save lots of tears and incrimination later. Covering a framed painting with glass is an accepted method, used by museum conservators, to prevent surface damage and, as well, to outwit thieves who steal paintings by cutting the canvas from its frame. 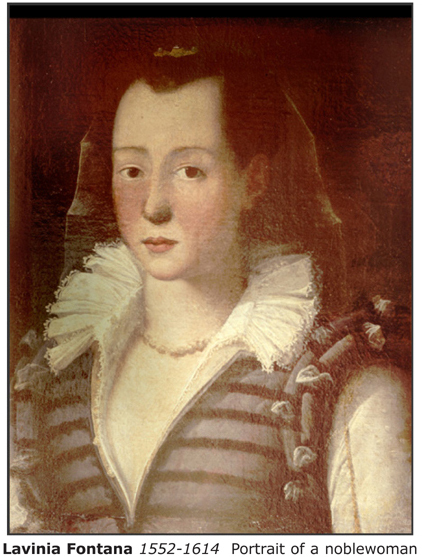 The painting by one of the few Renaissance female artists, the Portrait of a Noblewoman by Lavinia Fontana is a good example of an old painting discovered recently by a collector. It was in poor condition, dismissed as of little artistic importance beneath a thick layer of blackened varnish, stored away (from view) in a cellar. When discovered it appeared to be a modest painting from the seventeenth century painted onto a canvas of the same period. Although the painting was not signed, it was apparently a detail for a larger canvas, the restoration discovered an even more important indication of the artist. On the ancient and worm-eaten frame that held the canvas was an old inscription. This was a clue as to who the artist might be. Written in pen by a collector in the seventeenth or the eighteenth century, the writer attributed the painting to Lavinia Fontana. A quick search of some of the 135 paintings still existing, known to have been painted by the Renaissance artist, in particular the monumental Visit of the Queen of Sheba, in the National Gallery of Ireland - that this writer once restored - confirmed that the ancient inscription might be correct. The style of the anonymous writer’s calligraphy showed that the inscription had been written about two hundred years ago. It was written in a time, nearer than we are, to Lavinia Fontana’s active life in Bologna and Rome. The inscription was more likely to be accurate as, by the time it was written, the artist and her works had fallen into obscurity. 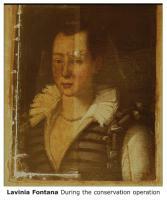 The photographs show what the painting looked like when it was first discovered, its transformation during the restoration process and what it looks like today. Saving and recuperating an old painting that is apparently in poor condition has permitted the work of art, once again, to charm the world with its ancient beauty for centuries more. 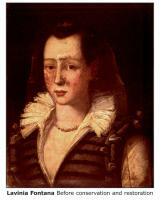 Lavinia Fontana’s Portrait of a Noblewoman, is now in a private collection in the Principality of Monaco. London, Paris, Amsterdam, New York. In these cities, if you own an old painting, the principal art museums want to see it. You will also be given a complimentary consultation and receive advice on the work of art’s condition, its state of preservation and suggestions for maintaining it in good condition. Your painting will be examined by a specialist curator, often with an international reputation. You can, if this is not convenient, make an appointment and take your painting to the art museum nearest to you. The curator will have just the expertise you need to evaluate the work of art. In addition, the advice will be objective and it will be free.